It's pretty simple. I emailed the wife of one of my very old friends here in Nepal and told her I had just finished a set of IT support courses and was there anything I might be able to do for her. She said, Come to Nepal and we'll see. It took me three years to get the money together for the airplane ticket. That contract lasted a couple of years. I custom-designed a database for Lajana's NGO and made some suggestions about other tech improvements they could make. But they weren't really open to thinking strategically about technology. They persisted with the idea that I provide some kind of standalone product that they wouldn't do anything about except somehow "have" it. I met my current clients while visiting the various members of my Peace & Travel organization, Servas. I came over to Bhaktapur just to meet them, the same way I had the orthopedic equipment salesman earlier that week. Surya, the executive director of RCRD, is a really forward-looking guy, very quick to see possibilities and immediately he peppered me with questions about his database dreams. The following year, I worked directly on a database design for him, and this year, five years later, he proudly showed me the nationwide database of disabled persons that has been the result. In 2006, my husband Jean-Francois had a sabbatical and so we spent 10 months going around the world-- a dream of his since our far-flung traveling days 30 years ago. Wherever we went, I tried to contact NGOs to offer my Worlds Touch services. I stress that I don't work for nothing, that I am not a volunteer. I request each organization I work for to provide me with room and board. In Cambodia, that meant actually paying me for my hotel room. In New Caledonia, the executive director (like many NGOs in developing countries with foreign visitors and volunteers and interns and fellows, etc.) had an extra apartment in town and offered it to us to stay in while I worked on research for their web site. In Darjeeling, the Rotarians suggested the Jesuit-run charity that I am involved with. I'm somewhat dismayed to see these agencies spring up that purport to do all the work of connecting volunteers with organizations. All you really need to do is walk in the door and make them an offer, the same way we do it in the States! I understand American parents' fears and trepidations and desires to have insurance and medical evacuation coverage and all that. I've thought Worlds Touch should get some of that business-- it's quite lucrative. People pay plenty of money to go wash their clothes in a bucket and eat rice and lentils and sleep on thin mattresses these days. It could be a good income stream. And then I think...Naaah...That is not what we do. And it's not what I believe in, either. I believe in reaching across the barriers that divide us, even to the problem of finding clients who want what I have to offer. I've been quite fortunate that the places I work with are pretty ethical and honest and diligent and mission-centered. [Bhaktapur, Nepal] The Worlds Touch work in Nepal is significantly different from that in Darjeeling, India. In Darjeeling, I was a volunteer with Hayden Hall for four months in 2006 while on a Rotary Club scholarship to learn Nepali. I had been approved to go to Nepal itself, but then the Maoists were waging war against the government here, so the Rotary Foundation balked at sending me there. Then I learned that the Darjeelingites (?!) are a Nepali-speaking people, so I shot off several emails and finally met with success. The last time I was in Darjeeling, in 2008, the political situation there was unstable. We managed to participate in one health camp, paid for by a generous doctor friend of mine, and then the town shut down tighter than Davy Jones' Locker. Jean-Francois freaked out at being unable to get outa Daj. My contacts at Hayden Hall said the personnel situation there made it impossible to consider any sort of volunteer work there. So this time, it was in effect, a totally new world in Darjeeling. My Rotarian friends were all busy-busy-busy shooting a movie and other personal stuff. The guy who was supposed to be organizing a video production workshop didn't get his act together at all. Hayden Hall, on the other hand, has a new director who was thrilled when I showed up because he's been wanting to do this book and there came me to write and supervise three college students to get it done. Father Kennedy didn't tap into my tech consulting capacity until the end of my trip there, but then we did manage to look into the self-hosted version of WordPress. He taught computer science before he became director of a huge social service org, so he could figure out how to set up a local host so he could really play with WordPress. He was also interested in Tactical Tech's NGO-in-a-Box stuff. I arranged for him to receive one of their free CD packets, but when it came, it was all Linux OS focused (he's running Windows) and still required downloading from the internet. I had thought one reason they provided the CD "in a box" was to facilitate software acquisition by folks with incredibly slow internet connections. We're working on this one. Is Hayden Hall a client yet? I'd say a qualified yes. Father Kennedy may very well start taking advantage of my talents on subsequent visits. Here in Bhaktapur, though, I've been working with Surya and Ramesh at Community-Based Rehab and its Resource Center for nearly six years. My first encounter, we played with an access database and Surya's dream of having a database that could be disseminated throughout the disability community of orgs so that data gathering about the disabled in Nepal could start taking place. That database-- after one false start with a local programmer-- is starting to become a reality, "thanks to your encouragement," Surya and Ramesh told me my first day here. On my last visit, in 2008, I built two websites for the two organizations housed here together. 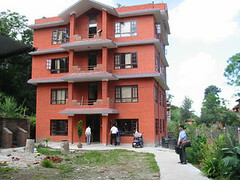 The first, CBR-Bhaktapur, provides direct service to disabled people and trains teachers, social workers and others to include the disabled in fully integrated classrooms and social situations. The second, RCRD (Resource Center for Rehabilitation and Development-- sheesh, I would change that name in a heartbeat if I had any control over the branding of this outfit) is a library and training center, aspiring to become the nation's data collection center on disability issues. We've put together an ambitious program for my monthlong visit. I'll share that information in another post. I'm challenged with questions I have to research, I'm gratified to find people who like what I can do and want my contribution (as I found in Daj with Father Kennedy as well! ), and I'm with good friends in a fascinating culture. Win-win-win-win. I have a packing list* that I put together years ago. I'll use that as a kind of template, and then modify what actually goes into the bag based on this year's contingencies. For example, I'll take even fewer clothes than usual this time because I am planning to stock up on salwal/kameez the minute I set foot on Indian soil. I may actually take a taxi from the airport to Fabindia, just to get myself what I need for my first day. For the rest, I'm out of avoidance mode and into getting roughly one packing/organizing thing a day done. Yesterday, for example, I bought a pair travel capri pants. Airplane travel requires TOTAL comfort, on the feet, around the waist and across the shoulders. Fashion be damned, if necessary. Friday, I had a visit to the doctor to stock up on drugs. I got my regular prescriptions for allergies and acid reflux in a two-month packet, as well as sleeping, diarrhea antibiotics, and nasty-pain meds. I'm not doing special shots. I'm not going anywhere where there's cholera or hepatitis rampant. I can get shot there if I need to. In fact, the general rule is: You can get it there. Don't bother schlepping it. So: Shampoo, hand lotion, hair dye (it is two months, after all...you think this red hair is God-given? Ha!) and even a cell phone-- all this is available in India/Nepal for cheaper and more adapted to the ways of the land. *While you're at the road, the road, check it out. It's the first book completely online, made for the internet, that I had ever heard of. I thought I'd invented the genre. Probably not, but still, a great exercise. My inspiration, colleague and friend Gilda out in San Diego (and what I wouldn't give to spirit her over to a house next door to me!) makes an interesting suggestion about how to cost out what it is you are actually spending. I was musing that it would be cheating to bring my laundry over to my own house to get it done, but maybe not if I took it to my son's house, since he lives at about the same level I'll be living when I move to the West End. Gilda makes the point that all those kinds of barters should be figured in as "in-kind" costs, giving me a much clearer picture of how high on the food chain I'm actually living. If I don't pay for my own washer and dryer and electricity or gas to run them, then lower on the ladder is simply washing everything by hand. If I barter or in the case of Raf, just show up at his door because I'm his mother...then the cost of those appliances is still there, somebody else is donating that to me-- in this case, the Association of Retarded Citizens of High Point, which provides the subsidy so Raf can afford his housing. When you run a nonprofit, many grants from foundations and the government require some sort of "matching" amount, much of which can be provided in "in-kind" donations. Sweat equity, for instance. Gilda says that when I go visit my "real" house on the weekends, that should be considered an in-kind cost, since somebody has to pay that rent and utilities. I told Gilda that I know she's absolutely correct, but there is a deep laziness in my bones that balks at all that accounting. I need a bean counter at my elbow, a volunteer accountant. But wait! That would be an in-kind expense as well! I have always found that trying to set up technology projects in Nepal before I get there is both frustrating and futile. My Nepalese--and it can also be said, my North Indian--contacts like to discuss this sort of thing face to face. Which is why I'm on my Summer 2008 Worlds Touch trip to the Himalaya with only one project in my pocket, the health camp with the Darjeeling Rotary Club. We've had that one in our pocket since I came back from my Rotary scholarship in late 2006. That's a great opportunity-- the local doctors in the city donate one or two days of their time and Worlds Touch pays for medicine, travel expenses, and some follow-up visits to specialists in town for those with serious illnesses. We will be working with Prolad Roka, the Darjeeling Rotarian with the most techie interest in documentation, to get the whole event in photos and videos this time. Many people saw the video that Prolad produced last year and were quite moved by the help these local doctors provide to folks who live too far away from medical facilities. What else are we planning? Our first stop is at Resource Center for Rehabilitation and Development/Community Based Rehabilitation (RCRD/CBR for short) in Bhaktapur, Nepal. This is an organization with a healthy interest in using technology to further its mission. Surya and Ramesh, the two guys who lead this organization, are what we call "early adopters." They are ready and willing to learn about the capabilities of the software and hardware they've already got and to use it. These folks were putting videos into their PowerPoint presentations before I knew how to go about it. They have been talking about social enterprise solutions to the funding dilemma since the beginning. They had the foresight to built guest accommodations in their office building, and this is where we'll stay when we land in Nepal tomorrow. We don't have a plan yet about what techie stuff I'll be doing with them...As I said, all my Nepalese friends like to do business face to face. But I've got several tricks up my sleeve and it could be that one or several of them will appeal to my friends. The other idea I've got came in the mail today. 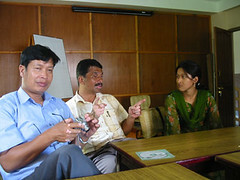 FIT Nepal, Forum for Information Technology Nepal, is putting together a conference for late June on the topic of Rural Telecentres. Since I created a "telecenter" at West End Ministries where I've been serving as a technology and marketing capacity builder sponsored by the Volunteers in Service to America program. Maybe FIT Nepal would like some help with their web site. Or maybe we could visit some of the telecenters around the countryside and take photos and videos for a promotional or fund raising campaign. Or perhaps I could present at this conference. Or do some training at some of the centers. I emailed their director, Allen Bailochan Tuladhar, and we've got an appointment on Monday morning to talk about what we might want to do. I am also in contact with my other Nepali friends and colleagues at Lumanti, Support Group for Shelter. I created a database for them while I was still a back-to-school-mom student. I have a whole batch of beautiful knit puppets that one of our West End Ministries supporters gave me to take to the children of Nepal. I have been thinking the Child Groups at Lumanti would maybe be a good place for these puppets. So there's stuff to do, and some contacts. And nothing signed on any dotted line. Your basic Worlds Touch trip. This is the building where we'll stay. It's the eve of a Worlds Touch trip to India and Nepal. I'll be working on this blog over the course of the next few days, to see if I can't bring it back into the fold. This is the official blog of Worlds Touch, the international organization that is dedicated to bridging the digital divide across the globe, but specifically in the Himalayan mountains. Why that particular place? Because the folks there speak Nepali, a language I've been working on for the past three or four years, and because It's a part of the world I want to keep returning to. Of course, social work is social work, no matter where you do it, and Worlds Touch is technology social work. Or maybe I should say social work in technology? Okay, so where are we? We have one project that is confirmed for this trip, a Health Camp with the Rotarians in Darjeeling, India. That is strictly NON-technological, except insofar as the video we're planning to shoot to document what the health camp is and does in the mountains of India. We are bringing our Flip Videos, two of the three bought in the promotion that PureDigital , the company who makes them offered nonprofits this year. It was a sweet deal: Buy one, get one free. We furnished a very simple grant application and they approved both Worlds Touch and my last organization, West End Ministries. So now WEM has four and we have two. It turns out High Point University, where my husband Jean-Francois Llorens works has four more. So this looks like a coming technology-- a low-tech camcorder, a simple hand-held video camera, a dead-easy-to-use gadget that allows you to download the videos directly to your computer. I'll be posting some of the videos we've taken lately here and on the recently updated web site of West End Ministries, one of the WT projects we accomplished during my year as a VISTA volunteer. In the meantime, I'm frantically searching for phone numbers and addresses of my contacts in Nepal. I haven't been to that beautiful country for three years. 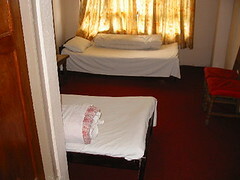 I'm going to purge the photo albums on this blog to the Nepal photos, and may actually cull that group further. This is -- I think, because it's almost impossible to tell WHAT the dad gum thing does -- a system that is supposed to track the various services that America's homeless receive so that they aren't wandering around from agency to agency, mainly falling through the cracks. Get this: The whole site is a series of standalone documents that you have to download just to see them, and it takes at least three and sometimes MORE clicks just to get to the documents in the first place. Whoever put the site together is an idiot, as well as knowing almost nothing whatsoever about web design. Totally user insulting...unfriendly is an understatement! I found it nearly impossible just to get an idea of what the system is supposed to be doing. Geez, maybe they could use my services! What they are mainly lacking is an information architecture that informs and then guides the user. Interesting that Joomla, the web system they are using as the structure, could be used in such a terrible way. It may be a case of: It's so simple to use, even an idiot can use it. And then they find idiots who can and do! If I were the Joomla folks, I would quickly help these pathetic folks, or disavow all connection. They are giving Joomla a very bad name here. My guess is that nobody will use this system longer than about five minutes. It will fall into disrepair and crumble, unless they figure out how to THINK about the people who are going to be using the system. What follows is my own personal experience at the Nonprofit Technology Conference, the biggie conference for people in my field. Wednesday night: Internation Dinner with Teresa Crawford, Bill Lester and the CIO of Save the Children. It was a fine dinner but I didn't feel it advanced my network of international service providers, though I did have a good contact with Bill Lester, the big name in Engender Health. Teresa and I have had some contact before this, so even though I'd never met her, it was as though I had and we were just renewing acquaintance. Thursday: Make your newsletter work better: Left--looked like a wrangle about whether newsletters are valuable at all. What technology can do for your mission: This was presentations by two orgs (I missed the first one, Ashoka), one a poverty org in Philadelphia where their techie talked about using "Effort to Outcomes" software to really document the outcomes of the work they do. He made a very good case for intensive documentation using this software. After him, there was the CIO of Conservation International, and I got a glimpse into what a truly large and well-funded international org can look like. They have offices all over the world with the goal of making them all equal. Which means nearly 100 per cent online, email that functions all the time, and satellite connections everywhere. It's a huge committment of time and money and it pretty much daunted me. How Low Income individuals use technology This is one of the most valuable sessions I attended, since it gives basic foundational information about how our clients use the internet, their cell phones, etc. This gives me some very good ideas about how to offer services at the Community Tech Center, when and if we get one up and running at the West End Ministries (WEM) community center. There is also a web site that is tailored to low income clients-- language they can read, and services they want: FAFSA, Income Tax Credits, Diabetes monitoring, etc. It's The Beehive. Building better online fundraising campaigns This was also an eyeopener, since it was a very detailed look at how to craft an email appeal for funds. It broke the email into component parts and then took you through how to maximize donations using the different parts together. The second speaker here talked about how to test for your own email list. By the way, the minimum number for a decent return donation is a list of 20,000 subscribers that you continually grow, since you lose a certain percentage every year. I've also since found an email company, Constant Contact, that has really reasonable rates. Since WEM wants to launch an email appeal, this is an excellent info. I doubt they have anything like 1,000 names on their email subscriber list, but they are all also previous donors. Nonprofit Tech Consultants Affinity Group: Left--too much going around the room listening to people talk about how they got into the field. Community Technology Centers & Programs The once-federally funded CTCnet has lost much of its federal funding and is now lacking an ED. This was one of the sessions where the audience, notably some of the important people (I gathered) in the CTC field, basically took over the whole session and the kids who were trying to run it were out of their league. They kept trying to say damage control things, but really, they have lost their momentum. Consequently, I'm not at all sure what these people will be able to do for us as we move into the CTC fold. But there are two very important orgs in the area that ARE doing the community technology center thing, and I know who they are and how to contact them, so that will be one of the first jobs once I'm at work for WEM. IT Budgeting: Templates for IT budgets This session fit right in with the financial management session from the Duke course. I now understand accrual basis for accounting, and also how to project costs for IT into the future of the equipment. The session puts some very basic items that most people don't think of onto an excell-like template and puts out some information about the steps involved in coming up with a budget projecting three-to-five years into the future. With these two courses, I'm feeling much more solid in the whole finances field. I know that I don't want to handle our finances or do the bookkeeping, but I have a much clearer idea of what our financial person is going to do. Effective management of online collaboration tools What somebody said at the end of this session is that this is much more about project management, any project management, than it is about collaboration. But the slides were funny and effective, and available at their wiki, once you join the community. And a really funny video about herding cats. Networking and Friend-Building I know this is an essential part of any successful nonprofit, and any successful consulting job. I watch other people just zip in there and before you know it, they are exchanging cards and promising to get together and thinking their careers will go forward with this contact. There are times and places where I'm better at this than others, but the techie crowd and a huge conference is not one of them for me. I went wanting to meet the people behind the names on my email lists, where I've learned so much in this field. I saw one from a distance, met one really, and actually talked to one. I made one lunch friend and he gave me some good advice and we exchanged cards. Another fellow, from the Dallas Central Ministries, I will contact since they are already doing what we want to do at West End Ministries. All in all, I'd say that I focused most of my efforts on sessions that are directly relevant to West End Ministries, where I'll be working for the next year. That's appropriate, I think, though I'm so attracted to the GIS, wireless and radio possibilities that maybe at the next conference, the Grassroots conference in Lowell, MA in June, I'll be able to explore some of the edgier ideas. Deborah Elizabeth Finn, one star among many that I didn't get a chance to meet at last week's NTEN conference, has posted a call for debriefing comments about the conference. Actually, I'm all set up today to go through the huge packet of advertisements, business cards, conference slides on the jump drive they gave us, and notes for just that purpose, so this is timely. I agreed with DEF about the information management issues, not having everything on one page with times and locations. I also found it difficult to find some of the conference rooms, the map in the front of the conference booklet being relatively unreadable. I also missed the usual conference giveaway of a pad of paper for taking notes. I picked up a tiny one at one of the vendors' booths, but really, I needed a notebook and left mine at home, thinking erroneously "Oh, that'll be in the registration packet." This was my first NTC, and I did feel a bit like a very small and invisible fish in a large pond full of glittering superstars. I had hoped to meet all my heros and heroines, and I did manage to meet three: Bill Lester, Beth Kanter, and Teresa Crawford. Teresa spearheaded the very small circle of international techies and orgs with a dinner on Wednesday night. In one way, I'm glad there wasn't more INTL focused sessions because I'd have been torn between attending those and making it to the practical sessions for my upcoming VISTA project in a US neighborhood organization called West End Ministries. I didn't find it possible to meet the others, probably because I didn't have a clear plan or strategy or elevator speech or intro brand to put forward. Yesterday, on reflection, I thought that at some point, I'd like to do a session on International eRiding with a focus on getting international gigs on the fly, something I've done in Nepal, India, Cambodia and New Caledonia over the past three years. I know of one or two others who do this kind of work-- just go, and see where they can be useful and helpful-- and it might be fun to think about sharing this experience with the larger community. I learned a whole lot at the conference, however, and I want to stress this. Because this was done on a total shoestring, I stayed with friends and so wasn't able to attend the social events or even the speakers, as I didn't arrive before 10 am and had to leave at 5 because of where my friends lived. So what I got this time was sessions. I'll be reporting on those later today and throughout the week, and on how they directly speak to Worlds Touch and our upcoming project at West End Ministries here in High Point, NC.